Would it surprise you to know that the European Council on Trade and Tourism named Ethiopia the world’s best destination for tourists last year? Nine UNESCO World Heritage sites, landscapes that are both haunting and beautiful, some of the oldest churches in the world, a view of raw Orthodox Christian pageantry that quickens the pulses and takes your breath away—all a mere taste of what Ethiopia has to offer. And Ethiopia is embracing its international appeal. Recognising that an influx of visitors is all to the good for its people and economy. 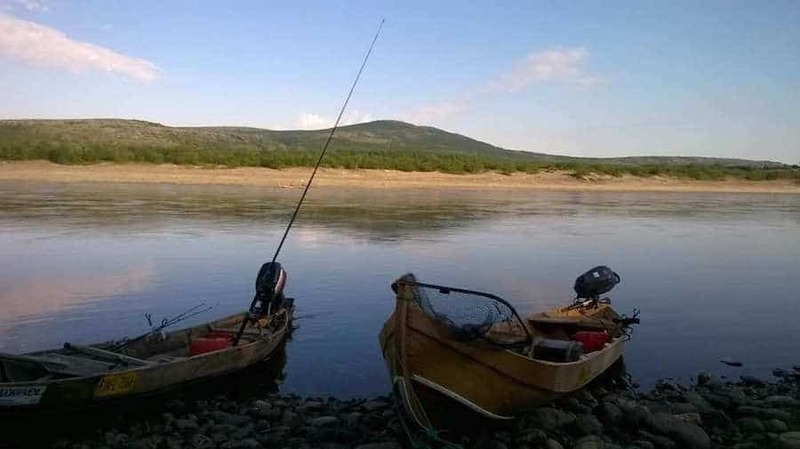 The government established a tourism council for the first time in 2013 and massive infrastructure improvements are underway. A large-scale expansion of Bole International Airport to accommodate Ethiopian Airlines’ new Boeing and Airbus jets. With a new nonstop service to major North American and European cities is complete. A glittering new superhighway connecting the Great Rift Valley with Addis Ababa and other major cities is nearing completion. There is also plans underway for new luxury resorts and hotels that appeal to western sensibilities. Ethiopia is ready for guests, and they are coming, with tourism expected to double to one million international visitors this year. Even the recent demonstrations haven’t dampened enthusiasm for Ethiopian travel. The Ethiopian government has taken steps in an abundance of caution to protect its citizens and guests from any disruptions. And, the measures haven’t affected the adventure travel economy or the warm, enthusiastic welcome Ethiopians give their guests. So if Ethiopia is on your travel bucket-list, it’s never been a better time to go. Sure, you could go to the beach or another glitzy tourist resort. But if you give Ethiopia a pass, here are 10 things you’ll miss that you can’t find anywhere else in the world. Ever heard of the Walia ibex? The Ethiopian wolf? 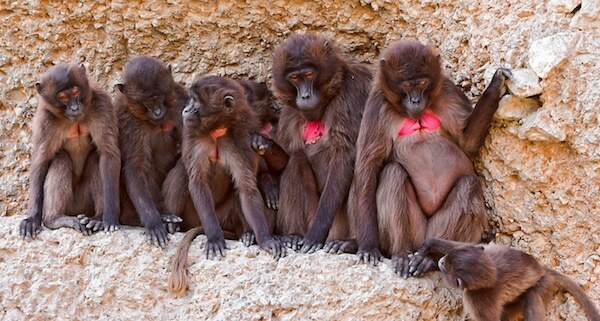 The gelada baboon? If you haven’t been to Ethiopia, probably not. These are just a few of the indigenous species that haunt the dreams of the devoted wildlife enthusiast. And you can only ever see them in the Ethiopian highlands. It’s also an ornithologist’s dream destination, with over 800 unique bird species. That’s nearly 10% of the world’s bird species and almost 40% of all species found in Africa. Catch a peek of the massive bearded vulture, also called the Bone Crusher, with its two meter wingspan and fierce yellow eyes…it’s a sight you’ll never forget. Don’t forget Ethiopia’s appeal as a safari destination, if that’s your thing. The rarest of the rare, Haile Selassie’s Abyssinian lions in Addis Ababa are a genetically extinct subspecies that no longer exists in the wild. You’ll recognize them by their striking black manes, think Scar from The Lion King. There are over 80 distinct ethnic tribes and groups, each with its own language and customs. And it’s a country with a geographic footprint similar to France with a population of roughly 94 million. Tribes like the Omoro have been in Ethiopia over a millennium practising a lifestyle and customs relatively unchanged over the centuries. In fact, there are over 40 distinct tribal cultures in the Omo Valley alone, that’s a lot of cultural diversity in a very compact space. 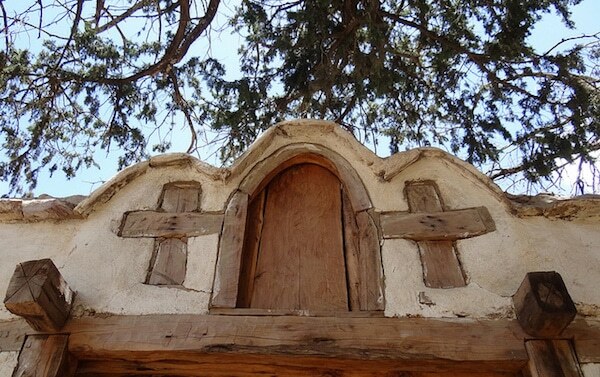 Linguists might be surprised to know that Geez, the liturgical language of the Ethiopian Orthodox Christian church, is one of the oldest of the remaining ancient languages with a historical record going back to the 5th century. Ethiopia has a solid claim to its title as the “cradle of humankind”. Where Lucy, the 3.5- million-year-old skeleton of a female of the hominin species Australopithecus afarensis, was found, along with stone tools dating back 2.5 million years. Ethiopia is home to nine UNESCO World Heritage sites, several of them related to its place as arguably the world’s first Christian nation. The 3rd-century stelae in the ancient kingdom of Axum, the rock-hewn churches in Lalibela, the castle fortress at Gondar, unmatched in Africa’s archaeological history. The old walled city of Harar Jugol in eastern Ethiopia (another UNESCO World Heritage site) is a 13th-century fortress claimed to be the fourth holiest city in Islam. If you are ever lucky enough to hike to the summit of the Simien Mountains, you may never want to come down. From the Roof of Africa, Ras Dashen (Ethiopia’s highest peak), the views are magnificent. Jagged cathedrals of stone haunt the Great Rift Valley as far as the eye can see. If you’re really lucky, you’ll catch sight of an elusive Walia ibex or gelada baboon, species who make their home in the stark and lovely Simiens. Ethiopia’s Orthodox Christian festivals are known around the world for their passion, pageantry, and pulse-racing intensity. Timket is the queen of them all. Timket, the Epiphany, celebrates Christ’s baptism by John the Baptist. 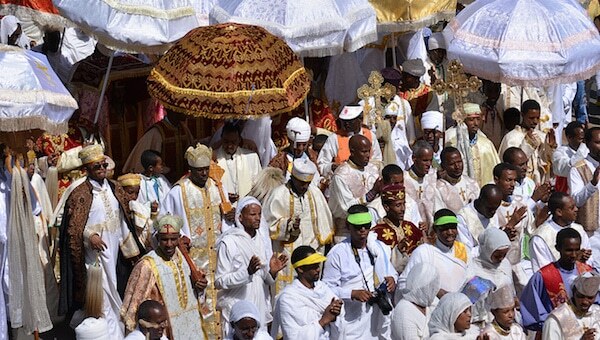 Taking place in Gondar, Ethiopia’s Camelot, Timket is an explosion of colour in a sea of white-robed pilgrims. Steady drumbeats, marked by hand clapping and ululating cries, set the cadence for the procession of the Ark of the Covenant, wrapped in golden cloth and borne on the head of the chief priest. It culminates in the blessing of the Fasilides bath. Take a dip yourself, it’s curative powers are the stuff of legend here. Axum, the most powerful kingdom between Persia and the Roman Empire with archaeological relics dating back to the 3rd century AD. Gondar, the magical city of Ethiopia’s 16th and 17th century emperors. Harar Jugol, home of 82 mosques and 102 shrines, a holy city in Islam. Konso Cultural Settlement, a fortified settlement of the Konso tribe, known for its sculpture and nearby fossil beds. Lower Valley of the Awash, where paleontological relics date back nearly 4 million years. 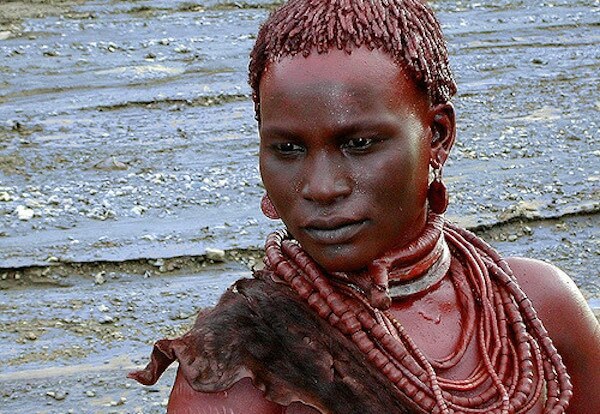 Omo Valley, a prehistoric cultural crossroads known for its diversity and fossil findings. Rock-hewn Churches of Lalibela, the site of 11 medieval churches carved from stone in the 13th century. Simien National Park, with its jagged landscapes and rare endemic wildlife. Tiya, the site of the 32 carved stela dating back to the 3rd century. Ethiopia’s nomadic peoples were enjoying its stimulating effects as early as the 10th century. Coffee still grows in its wild state in Ethiopia’s mountain forests, although its cultivation has become an art form in the country. There are about 400,000 hectares of delectable arabica coffee under cultivation yielding a remarkable 200,000 tons of clean coffee each year. Whatever you do, don’t turn down a coveted invitation to an Ethiopian coffee ceremony. It’s a sign of favour for a special guest. This elaborate ceremony is staged on a rekbot arranged over a bed of fragrant grasses and flowers. The hostess roasts the beans over a charcoal brazier and grinds them by hand with a mortar and pestle. Then it’s mixed with aromatic spices and steeped in a decorative clay pot known as a jebena. Bunna, as the coffee is called, is served with plenty of sugar and traditional Ethiopian snacks. There’s no “instant coffee” in Ethiopia! 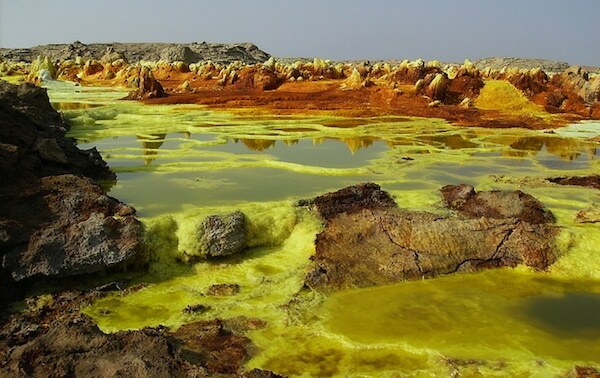 Sub-sea level, lunar-like volcanic landscapes in the Danakil Depression. 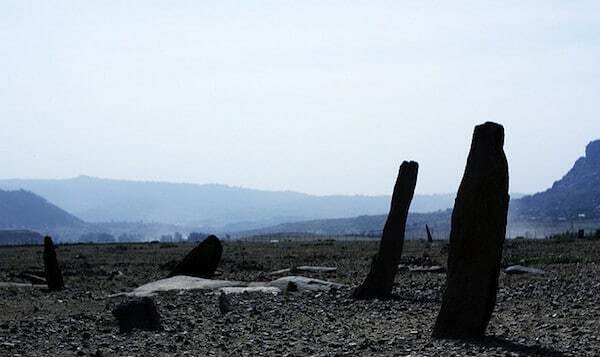 Lac Abbe with its limestone chimneys, mineral springs, and desolate plains. The great salt lake and black volcanic terrain of Lac Assal. To name but three of the stunning scenic areas in Simien National Park. 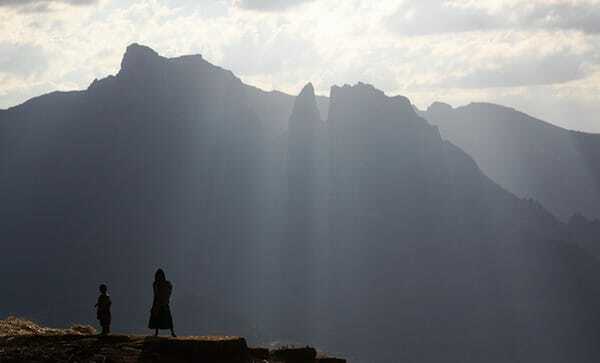 It’s all here in Ethiopia, one of the most dramatic and varied landscapes in the world. Of course, you can also get your fill of relaxing and serene landscapes, too. The Rift Valley Lakes are pleasing to the eye. 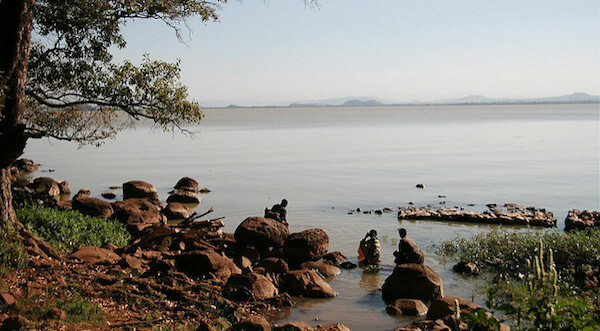 Or, treat yourself to a leisurely wildlife cruise on Lake Langano near the green southern capital of Awassa. 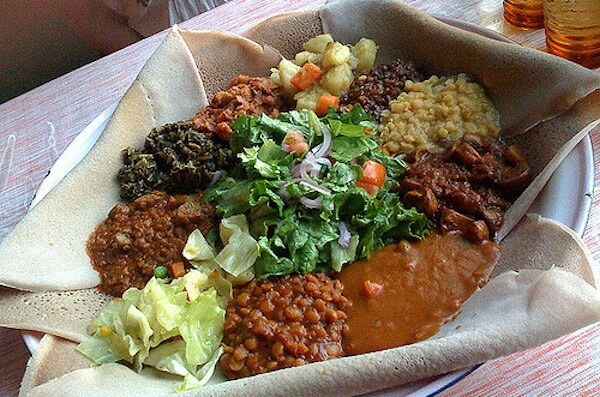 Ethiopia’s food culture revolves around communal eating and hospitality, extremely enticing for western visitors. The aromatic food comes to the table on a large round gebeta, or platter, and no utensils are needed. In Ethiopia, you eat with your hands using the ubiquitous injera, a bread made with teff, an indigenous grain, to scoop up the tasty juices and morsels. Ethiopian spice mixtures are a treat to the eyes, nose, and palate (berbere). The local masala, blends chilies, fenugreek, ginger, cardamom, cinnamon, and a host of local spices into a heavenly seasoning for meats, vegetables, and stew (wat). Here’s a bonus for people who want a great big Africa adventure: You can combine East Africa and West Africa into the safari adventure of a lifetime. Starting in Ethiopia’s Lake Tana (the starting point of the Nile) and moving through the Masai Mara in Kenya or the Serengeti in Tanzania. You’ll get a glimpse of the awe-inspiring game Africa is known for; Lions, rhinos, elephants, giraffes, buffalo, warthogs, and the great migratory herd of wildebeests. Or you could come to Ethiopia for the adventure of a lifetime. Why not get in touch and I’ll give you countless other reasons you should take a tour of Ethiopia.